Homes for sale in Cedarcroft are just over the Baltimore County Line (Less than 1/2mile South of Towson). A distinctive historic (listed on the National Register of Historic Places in 2003) residential neighborhood of about 125 homes located in Northern Baltimore City, Cedarcroft had its beginnings when The Cedarcroft Land Company built about 30 homes on land purchased by prominent developer Philip E. Lamb in 1885. His estate, which still stands today, is located at 6204 Sycamore Road. Today the Cedarcroft Land Company is gone, but the Cedarcroft Maintenance Corporation and Cedarcroft Improvement Association have taken over the responsibility of maintaining architectural and community standards as well as sponsoring social activities including October block parties, Halloween parades, and Christmas decoration contests. And not unlike many of Baltimore’s other more established neighborhoods, homes for sale in Cedarcroft offer’s its residents diverse architectural styles including Dutch Colonial Revival, Federal Revival, Tudor Revival, Georgian Revival, Cape Cod Revival, Bungalow, and Italianate, all nestled among mature tree-lined streets. While walking through Cedarcroft one may forget that they are in the city. However, Cedarcroft is conveniently located to much that Baltimore has to offer. Belvedere Square, just a hop skip and a jump away, is home to boutique retail shops, restaurants – Ryan’s Daughter, and Grand Cru, and a European-style fresh market. They even host an outdoor concert series every Friday Night from May to September. In the mood for Mexican or Chinese then you can pop in to Zen West and its sister restaurant Café Zen, right across the street from the Square. And who could forget two of Baltimore’s most enduring and comfortable watering holes – The Hollow (Or more affectionately known as the Swallow) and Jerry’s Belvedere. Several retail centers less than ½ mile away offer ample options for residents to buy groceries – Giant, beer, wine and Spirits at Pinehurst Wine Shoppe and Wells Discount Liquors, ice cream at Uncle Wiggly’s, hardware at Ayd Hardware and even partake of Baltimore’s own spin on Bowling – duckpin bowling at the Stoneleigh Lanes. And Baltimore Inner Harbor and Business Center is just a 15-minute drive down the Jones Falls Expressway while Baltimore’s cultural district, Mount Vernon is less than 10. Ready to check out all that homes for sale in Cedarcroft has to offer? If so, give me a call at 443-564-0952 or send me an email. I will be happy to create a free, no obligation automated home search for you that will deliver homes meeting your criteria directly to your email. Once you have identified the homes for sale in Cedarcroft that you want to see we can schedule a visit. ~Bel Canto~ awaits its new heir-apparent! This Acclaimed 5 Bedroom, 2 Full & 2 Half Bath Stunning English Cottage has been painstakingly renovated TOP to BOTTOM by an illustrious architect couple sits in Historic Cedarcroft. Seamlessly entertain in a beautiful open first floor that invites fascinating conversation around its fireplace as well as dining in an adjacent Formal Dining Room. This exquisitely cared for 1920~s Prewar Residence with its incredible original details offers: 9ft Venetian plaster walls, 3 Level Open Staircase, Main level oak/black walnut inlay flooring with heart pine flooring on upper levels. Double-paned~ Aluminum clad wood Pella low-e windows, Spacious Family Room/Sunroom with Quarry Tiled flooring and its own wall of windows, Recent Kitchen w/ 30sf of countertops and voluminous 167 cubic feet of storage delights any cooking enthusiast. Three generous 2nd level Bedrooms can be flexibly arranged as a bedroom/office/nursery to suite your needs. There is a convenient ensuite bath in the middle bedroom~ for out of town guests. Large renovated bath with soaking tub and a hall walk-in cedar closet concludes the second level.~ You will then arrive to your private 3rd floor Master Suite complete with modern private bath and large closet/dressing area with 23 linear ft of rod space.~ Also~~ a mystical secret nook that will delight everyone!~ Have Fun in your lower level game room (present use), craft or man cave with its own half bath.~ A large stone patio adjacent to the kitchen supports easy access to outdoor living/relaxing while enjoying the professionally landscaped garden with Birch forest & 100s of shrubs waiting to bloom! Along with ample basement storage and specially outfitted the two story detached two car garage offers unprecedented amount space and storage on 2nd level. Garage could be repurposed into a convenient sculpture/artist studio.Off-street driveway can accommodate 4 or more parking spaces. Many award winning schools are located within a mile radius of this special property. This Classic home presents well-designed, flowing and versatile spaces for today's living while maintaining its timeless elegance within natural garden setting.~ Enjoy living in this glorious home reminiscent of a vanished era~~Were Expecting you! Enjoy the brand new central air conditioning - just in time for warmer days! This is a great opportunity to own a spectacular home in Historic Cedarcroft! You'll be immediately drawn to the incredible curb appeal of this lovely home, situated on a large, beautiful lot in one of Baltimore's most desirable neighborhoods. You'll enjoy the quiet, tree-lined streets, and also the walkable accessibility to local shops, restaurants and all that Belvedere Square has to offer. Imagine relaxing on the beautiful front porch or enjoying hours of fun with family and friends on the spacious, walk-out deck in the large, fully-fenced backyard. The interior flows easily, with the kitchen opening up to a large dining area, extending to a spacious living room. The living room features a wood-burning fireplace, with charming french doors that open to the covered front porch. Windows abound, offering panoramic views, with natural light streaming throughout. The home is recently refreshed, featuring a new cooktop, dishwasher and double wall oven. Highly livable and well-maintained with great updates, this home offers terrific value and tons of potential. In the Roland Park school district, and convenient to many of Baltimores best private schools. Welcome home! Rarely available 5 bedroom/2.5 bath home in desirable Pinehurst! Choice of county or city schools! Updated gourmet kitchen with mudroom area opens to dining room. Inviting living room with gas fireplace. Main level also has large family room and 1/2 bath! 4 bedroom and 1 full bath on 2nd level (house is priced for new owners to add additional bath on 2nd floor). 3rd floor- 5th bedroom, full bath, and attic storage with cedar closet. Bonus room and flush in basement. Large, level yard with private patio! Centrally located! Small portion of the lot is in the city ($110/year city taxes). 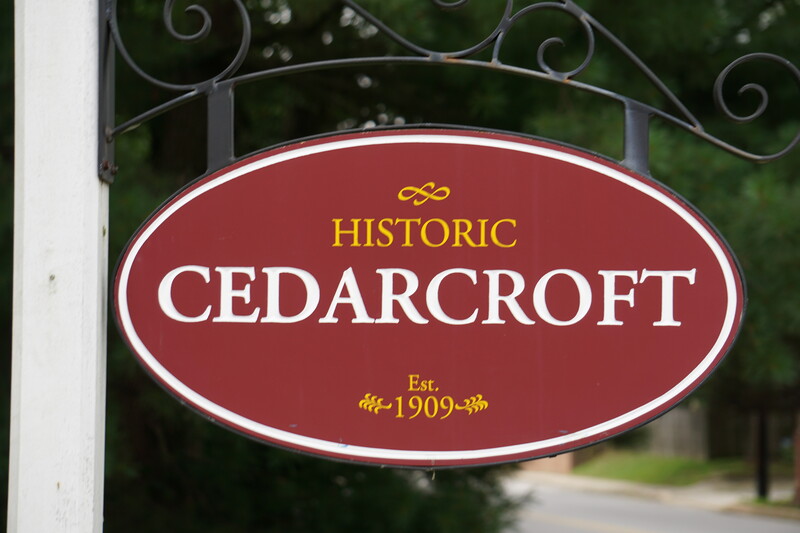 Welcome to Historic Cedarcroft. This beautiful sun filled Colonial features: wood floor throughout, four large bedrooms, five full baths (one on the main level), a spacious kitchen with island and desk area, double oven with convection, warming drawer, gas cooktop with downdraft, granite counters , stainless steel appliances, family room, dining room, living room, master bedroom with walk in closet, additional bedroom with attached study, fully finished basement, wine cellar, large deck, landscaped yard, zoned heating and cooling, finished garage with HVAC. Updates include: heating, windows, electric, plumbing, sewer line and house / garage roof. This home has a great location. Roland Park Schools. A must see! Lovely Split Brick Level in Cedarcroft with cozy front porch and an attached garage. Beautiful wood floors, 3 Large bedrooms, 2 full baths. Family room with Fireplace. newer water heater & furnace. Cedarcroft remains one the friendliest and the most peaceful and beautiful neighborhood In Baltimore City. The tight-knit community comes together naturally, celebrating October block parties, Halloween parades, and Christmas decoration contests together. This historic district is quite simply a diamond in the rough of an evolving and progressing city.